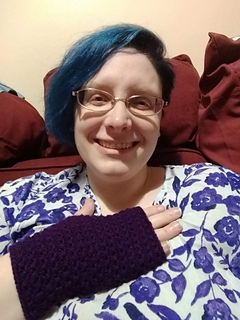 Perfect TV knitting, whether you prefer to do yours flat or in the round - these fingerless mitts have a simple four-row pattern repeat and just one stitch across each row. 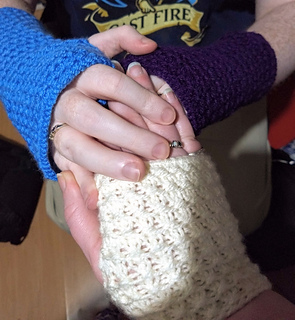 You’ll knit that stitch over and over until you get a pair of mitts you love. 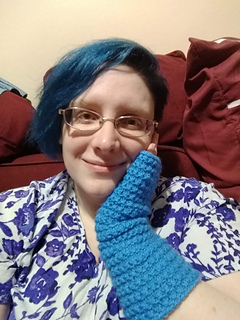 This pattern is written two ways: for a knitter who is comfortable knitting in the round and switching to rows for a thumb hole, and for a knitter who is comfortable knitting flat and seaming up one side. 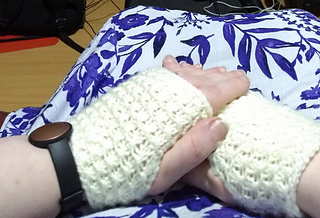 These mitts take anywhere from 1/3 to 1 full skein of Stylecraft Special Aran. However, you can use any worsted or aran weight yarn you prefer. The pattern as written provides for three widths (small, medium & large) and three lengths (short, mid-length, and long). Instructions are given for further adjusting the width. The stitch pattern used is charted for rounds and for rows.